The No. 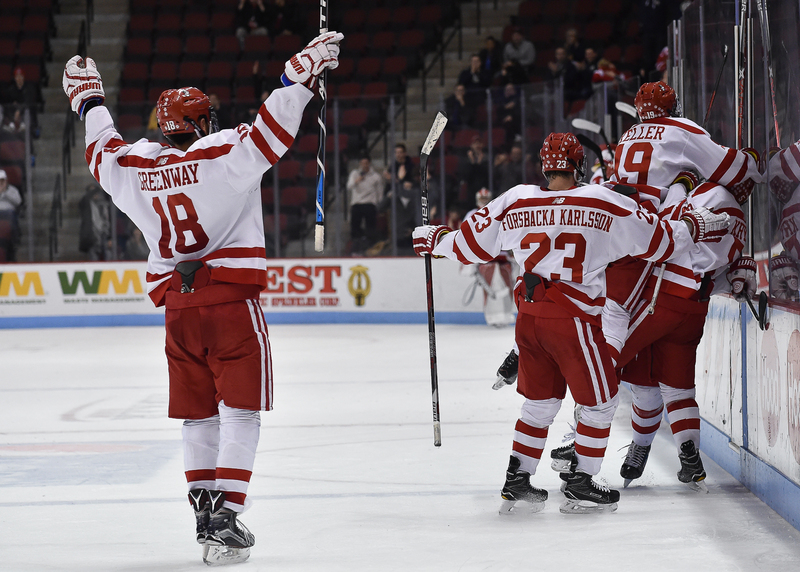 8 Boston University hockey team completed another third-period comeback, but this one was a little bigger and a little more important than most. 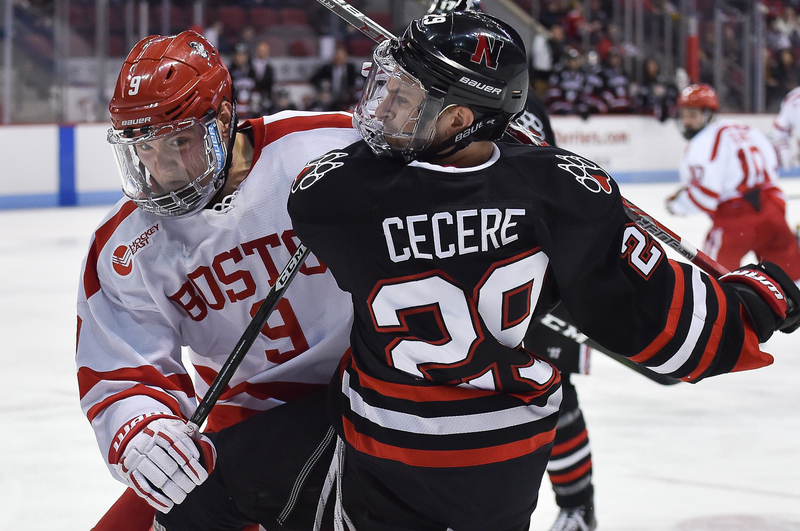 The Terriers (23-10-3) ended Northeastern University’s season with a 3-2 win on Saturday night and will now play in the Hockey East tournament semifinals at TD Garden next Friday. At the end of the night, special teams were the difference in the game. The Terriers went 2-for-3 on the power play and their penalty kill stymied the Huskies (18-15-5) on their man-advantage chances. BU head coach David Quinn couldn’t point to anything specific aside from great goaltending when asked why his team was so successful against the Northeastern power play, which is ranked second in the country. The start of game two between the Terriers and the Huskies looked eerily familiar to the start of game one. For the second night in a row, the Terriers went down 2-0 in the first period. Just 2:23 into the second game of the series, freshman Biagio Lerario got the Huskies on the board. Nine minutes later, junior Nolan Stevens scored his 10th goal of the season for the two-goal lead. Although the Terriers outshot the Huskies, 10-7, in the opening 20 minutes, based on energy alone, the boys in scarlet and white were doing the doggy paddle while the boys in black free-styled ahead. In short, Quinn said his team didn’t keep up with Northeastern’s energy in the first half of the game. The Terriers didn’t look much different in the opening minutes of the second period. The Huskies still controlled the pace and BU began to look frustrated. Even the otherwise-unfazed freshman goaltender, Jake Oettinger, lashed out at senior Sam Kurker after making a save. A small skirmish broke out immediately after, resulting in four penalties. Freshman forward Gabe Chabot served Oettinger’s roughing penalty while freshman forward Pat Curry sat next to him for hitting after the whistle. Next door, Kurker sat for goalie interference and sophomore Adam Gaudette sat for hitting after the whistle. Despite all the penalties, it was still 5-on-5 hockey. The next Terrier power play came later in the period when forward Matt Filipe sat for slashing. With the clock ticking, BU kicked it into gear. 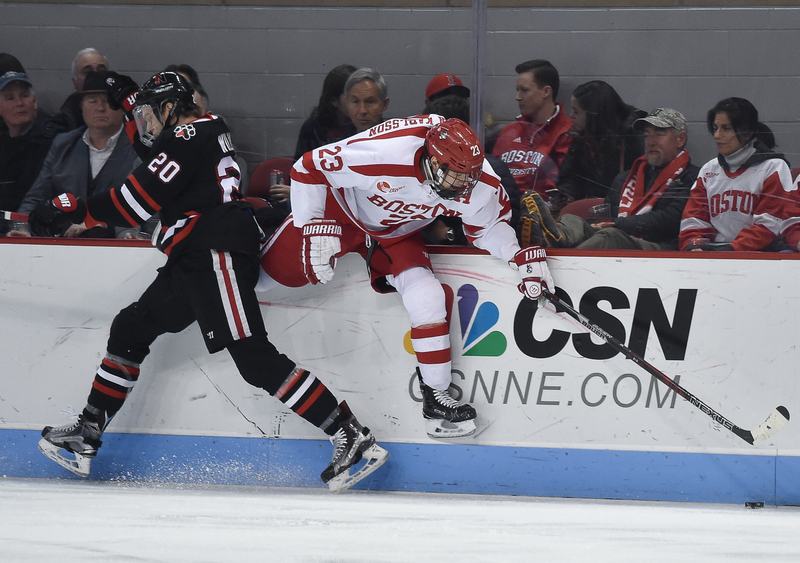 Freshman forward Clayton Keller dashed down the boards with the puck and found sophomore forward Jakob Forsbacka Karlsson as he made his way to the side of the net. The center tilted his stick and sent Keller’s perfect pass into the net past Northeastern netminder Ryan Ruck to make it 2-1. The frustration fueled the Terriers into the final frame. On Friday, the tying goal came from junior Chase Phelps nine minutes into the third. Tonight it came from senior forward Nick Roberto at 3:01. Once BU gained control of the game they didn’t let it go. Quinn said the Terriers kept the momentum because they kept things simple. With 1:34 remaining in the game, the Terriers went on the power play. They were handed an obvious opportunity and capitalized. Freshman defender Chad Krys scored the game-winner with just 24.9 seconds left in the game. Forsbacka Karlsson, who got the primary assist on Krys’ goal and ended the night with three points, said the play was a little bit of a blur. He said he is happy with his team’s recent success on the man-advantage. 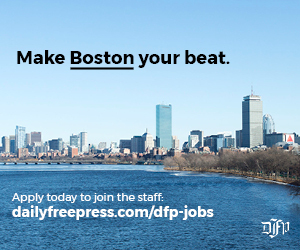 Every aspect of the game will be important when the Terriers head across town to TD Garden on Friday to face either No. 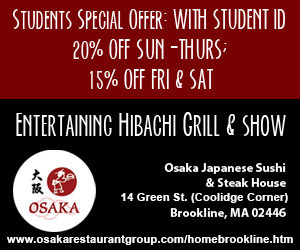 17 Boston College or the University of New Hampshire Friday night.